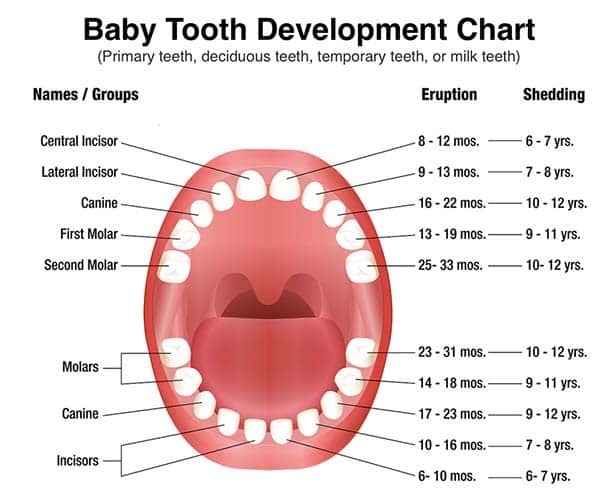 Children's teeth begin forming before birth. As early as 4 months, the first primary, or baby teeth, to erupt through the gums are the lower central incisors, followed closely by the upper teeth central incisors. 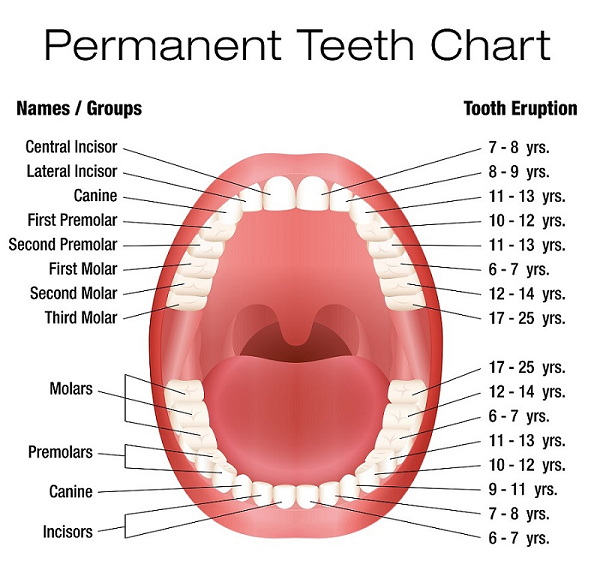 Although all 20 primary teeth usually appear by age 3, the pace and order of their eruption varies. Oral care should begin soon after a baby's birth. Gums should be cleaned after each feeding. You can begin brushing your child's teeth as soon as they appear. A teething baby can be miserable. Drooling, crankiness. and often a mild temperature can result from your baby's newly erupting teeth. It can be a hardship for both the parents and the baby. Rubbing your child's teeth and gums with mom's gentle touch and soft bristles can be a pleasant and bonding experience for your baby. Permanent teeth begin appearing around age 6, starting with the first molars and lower central incisors. This process continues until approximately age 21. Adults have 28 permanent teeth, or up to 32 including the third molars (wisdom teeth). Improper pediatric care can result in a child developing baby bottle syndrome. Click here (hospital dentistry) for a more detailed explanation.